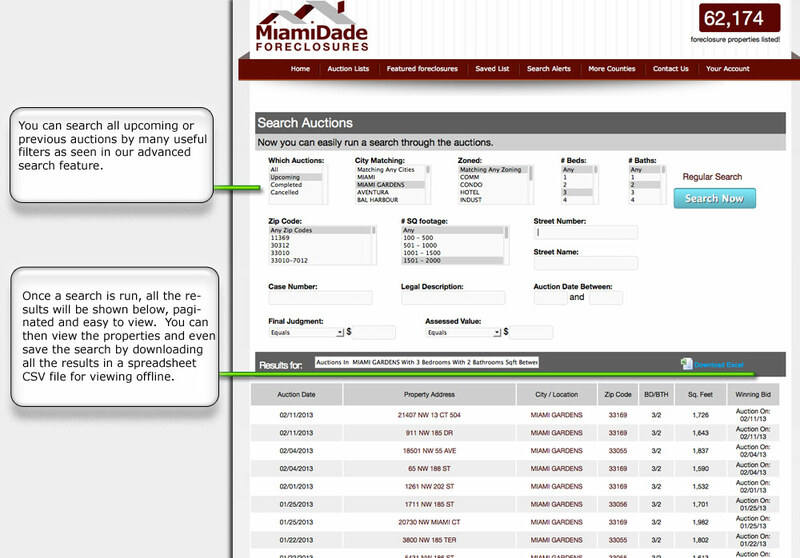 We give you the most advanced platform for buying properties at the Dade County foreclosure auction. Just a simple list of property addresses is worth the membership alone since the county only releases the case file number and date for the auctions. We take each address from the case file and extract all the relevant information you need about the property. We put them all the property specs into a searchable database so you can easily find all the upcoming address that match a search like "All properties in 33436 ZIP, with 4 bedrooms, 3 baths and between 2,000 and 2,500 sqft. A search like this would take you 10 seconds on our site, from the county site you would need to go through each property case file they list, search for the property's address through all the documents, put the addresses and dates in a spreadsheet, and go through each address and lookup the specs of each property. This would take you weeks to do! We do all the hard work for you! But we don't stop there! We also give you the ability to add notes to each property, upload documents and photos, and create unlimited "Saved lists" as well as setup alerts that goto your phone and or your email addresses telling you if a property got listed that matches your specified criteria! Our Advanced Customizable system is unlike any tool out there for foreclosures! #1 Advanced Foreclosure Property Searches that only we have! Left on your own with the county clerk's site, if you wanted to find a 3/2 with 2000+ SQFT in ZIP 33436, it's up to you to go through each case file they give you and find the addresses. Then you would have to copy all those addresses into a spreadsheet, lookup the specs on each property and type those into the spreadsheet. We do all this work for you and then some! You can do a search for a 3/2 with 2000+SQFT in zip 33436 in less than 5 seconds on our website and have a complete list of upcoming foreclosure properties ready to be downloaded as a spreadsheet file. There are many other search option like search by case number, final judgement amount, and other important fields as you can see from the screenshot to the right. There is simply no faster way to find a property with specs that match your needs than at PBCHomeAuctions.com! 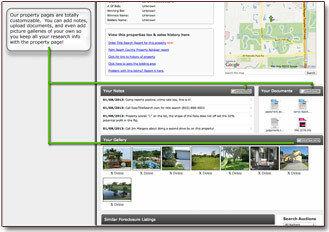 #2 Get instant Text message or email alerts for new properties! When you are trying to get an edge with the Dade County foreclosure auction nothing can match being notified via text message or email the minute a property comes on the list. This is why we introduced "Search Alerts"! With our exclusive "Search Alerts" you tell our system what type of auction property you want to be notified of the minute it hits our site. You can set the Search Alert to notify you if a property becomes scheduled for auction in a specific zip code, city, number of bedrooms or baths, square footage and many other search options. You can set the alert to be very general like "Notify me if any property matching the city "Miami" hits the county auction list, or as specific as "Notify me if a 5 bedroom 3 bathroom home in the zip 33426 with 3000+SQFT is added to the auction lists. There's no limit to how many "Search Alerts" you can add! #3 Organize properties that interest you into saved property lists! Browsing through 1000's of foreclosure properties is a daunting task, and finding the gems in the batch requires diligence and many "lists". Until now investors had to make their own paper lists of addresses or endless numbers of spreadsheets. We make it simple for the average person to do the research necessary to buy a property at the county foreclosure auction with our "Saved List" feature. When you browse through foreclosure auction properties you can click a "save" button to save the property to a list in your member's area. You can save as many properties you want to as many different customized lists as you want. It's a great way to keep your research organize and sort out only the foreclosure properties that interest you and need further scrutiny. 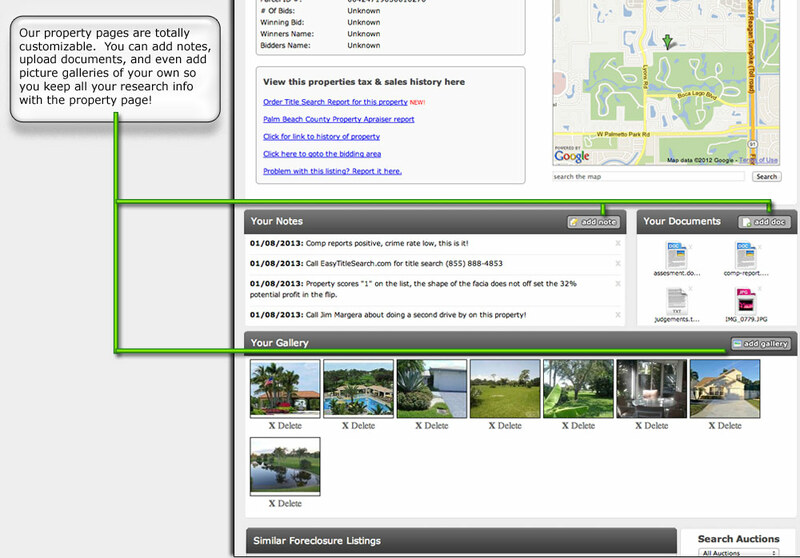 #4 Add your own notes, documents, and images to each property page! 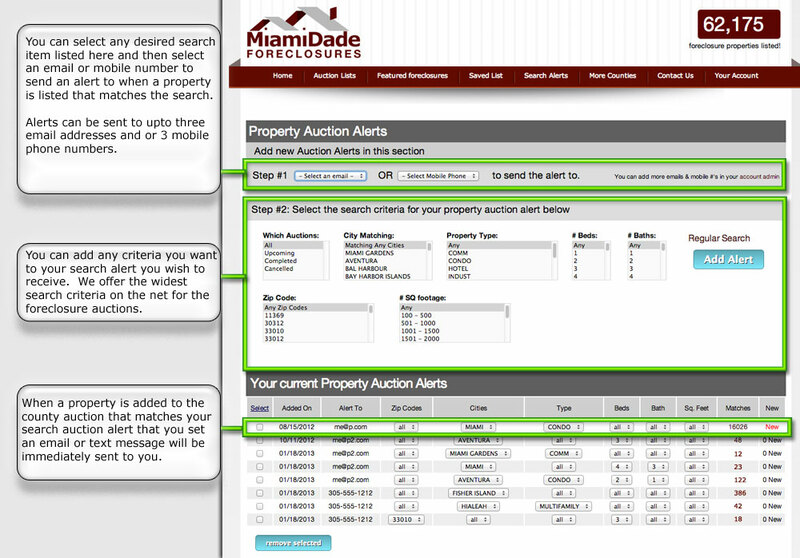 Buying a property at the Dade County auction used to be a daunting task for the average person. Not only did you used to have to sort through endless case files to find a single address, and through even more sites just to find specs. Then you had to keep folders of documents and pictures for all your research info on each property. We came up with the perfect solution to this problem by incorporating note taking, document uploading and picture gallery placement all on the property page on our site you are interested in. 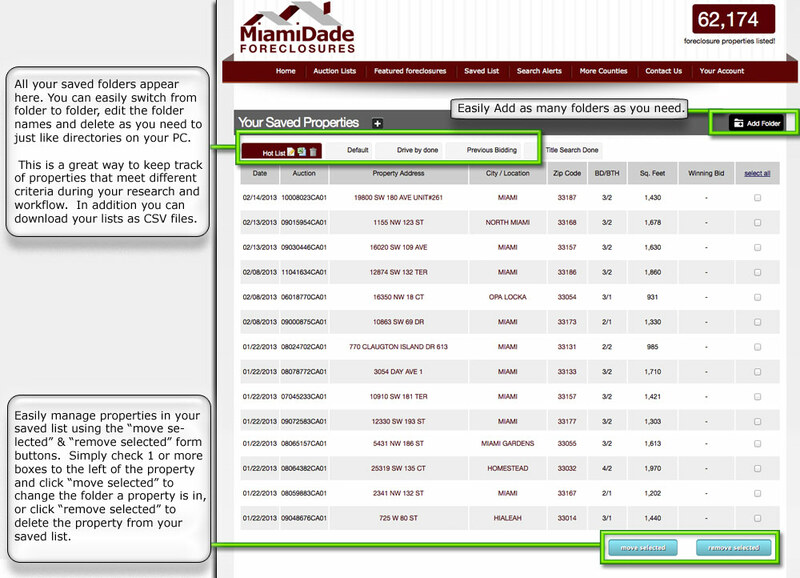 When a note, document or image is uploaded to any of the property pages here on MiamiDadeForeclosures.com, our system automatically places the property page in your saved property lists so you never have dig through pages or files to find the property info you were looking for. All the information of the foreclosure property including your own documents images, and notes are on one organized page! 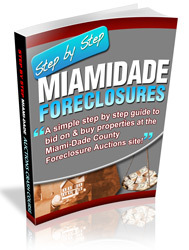 #5 Step by Step E-Book "Beginners Crash Course"
If you are new to buying properties at the Dade County Foreclosure auction the overall process of doing the necessary research and the process of bidding can be a bit confusing. So we took the time to create an easy to understand step by step E-book that our member's can download and view to get a quick start at the auctions! 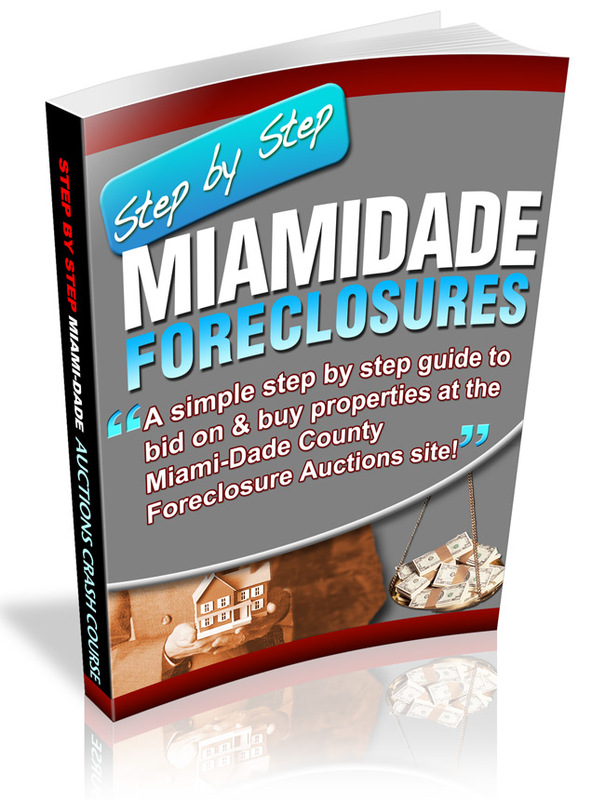 The "MiamiDadeForeclosures Crash Course" details how to do the necessary due diligence when buying at the county foreclosure auction so you don't get caught by unexpected expenses. We also take the time to walk you through the bidding process and just about all the basics so you can find a home you want, do the necessary research on the foreclosure property, bid on it and win it!